From Guinness record-holder, Wilson Casey, comes many new UFO-related terms never-before-released until now! Mainstream UFO curiosity seekers and readers are eager to learn! 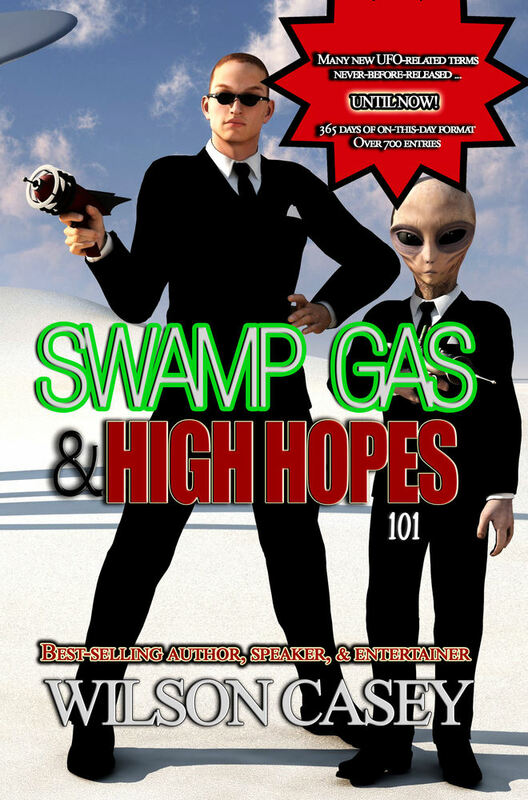 “Swamp Gas & High Hopes 101” provides answers. Each page corresponds to one of the days in a year and contains two unique treats: “On this Day in Ufology” and a “UFO Fascinating Tidbit or Term”. That’s over 700 entries to help readers decide for themselves whether or not extraterrestrials exist. For example, if one wanted to know what happened on a day such as March 10 or December 6, he or she could turn to that correlating page. Also on each page is a “Fascinating Tidbit or Term” listed in alphabetical order for easy lookup throughout the work. Each page is the best of both worlds: by day and alphabetical order. This fact-filled reference study guide also has blank lines for one to jot down notes if desired. Time to get beamed up for intriguing fun and entertainment!